The traffic triangle at the intersection of Division Street and Spokane Falls Boulevard is one of the most visible yet easily ignored parts of Spokane. 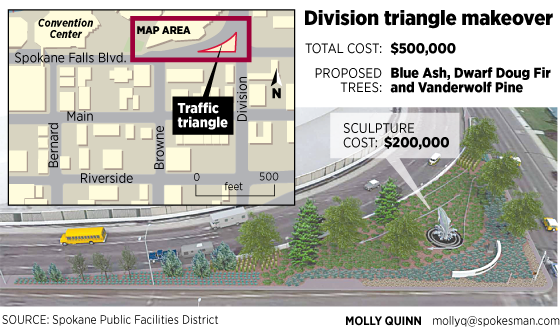 This summer, the Division triangle will undergo a $500,000 improvement, with new trees, more landscaping, sidewalks and a new piece of artwork called “Dance of the Redband” by Ken Spiering, a local artist with many well-known sculptures around town. The beautification project is part of a larger effort to remake Division Street as a more pleasant thoroughfare, beginning with the on- and offramps for Interstate 90, a $650,000 project that kicked off last week. The whole Division Street improvement area stretches from I-90 north to Sharp Avenue and encompasses gateways to downtown, the University District, Gonzaga University and the quickly expanding Convention Center area. “Seven years ago we tried to get this project done and we’re glad to finally see it moving,” said Kevin Twohig, executive director of the Public Facilities District, which is leading the project and committing $200,000 to it, specifically for Spiering’s sculpture. The quasi-governmental district runs the Convention Center, Spokane Veterans Memorial Arena and the INB Performing Arts Center. The project was designed by SPVV Landscape Architects. Five other local agencies are contributing funds to the project. The University District, Washington State University, the state Department of Transportation and the Downtown Spokane Business Improvement District, which is administered by the Downtown Spokane Partnership, are contributing a total of $100,000. The project has been approved by the city’s Arts Commission. Spiering, a graduate of Gonzaga, is probably best known for creating the big red wagon in Riverfront Park, which he called “Childhood Express.” He also made “Current Event,” the large school of fish that wraps around the east wall of the Convention Center, and “The Call and the Challenge,” which is behind the Convention Center and depicts Mother Joseph laying bricks for Spokane’s first hospital, Sacred Heart. Rusty Pritchard, senior project manager at Washington State University Spokane, said the university gave $10,000 for project design and another $25,000 toward construction. “Even though it was initiated by the PFD, we are a partner with them when it comes to general improvements in the area,” Pritchard said, noting that the university maintains the east side of the intersection. Pritchard said the new landscaping would set a standard for the intersection and called the Division triangle a “bookend” with WSU’s property across the street. The city of Spokane also is helping fund the triangle project – a surprise to City Council members when they heard about it earlier this year. Jan Quintrall, the embattled head of the city’s Business and Developer Services Division who resigned in January, committed $200,000 from the city’s parking revenue fund to the project without informing the council. City Council President Ben Stuckart called the project a “vast improvement” that was a “long time coming,” but he wasn’t pleased with Quintrall’s commitment of city funds before briefing council members. He learned about Quintrall’s promise the day she resigned, he said, when he received calls from Twohig and Mark Richard, president of the Downtown Spokane Partnership, asking about the project’s funding. Quintrall’s employment at the city was over effective April 2. Mumm said she supports the project, but said she pushed the PFD to include more pedestrian access to the triangle. Editor’s note: A sentence was added to this story on April 10, 2015, noting the name of the firm that designed the project.